Yay Zoya's spoon promo has gone live early! I just ordered my spoons. The only glitch was that you still have to enter a CC number, but it won't be charged. Check out their Facebook Page for more info. I've had this haul for awhile now and just needed to post it. I'm sad because I have so many Christmas polishes, these babies will have to wait! 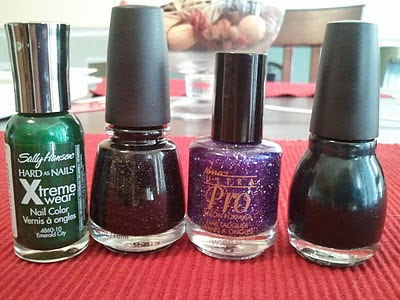 Sally Hansen Xtreme Wear Emerald City, Icing Blackout, Nina Ultra Pro Purple-Xing and Sinful See You Soon. These are all so gorgeous! I was able to use Purple-Xing in a recent contest entry and let me tell you she is one of my absolute favorites! 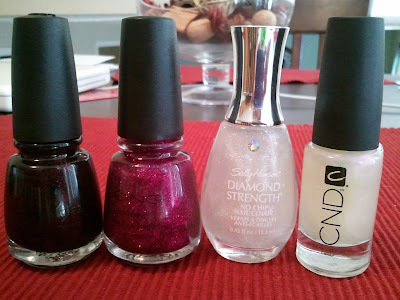 Great polish haul! Purple X-ing looks beautiful! Can't wait to see what Amethyst Sparkle looks like swatched! Nice haul! That purple glittery polish looks really intriguing. I also ordered my zoya spoons ^_^, feel the same filling the cc info, but appears as $0, so no worries :). Peach ~ I really think Purple-Xing is one of my favorite polishes! I want to layer Amethyst over Models Own, I can't remember who but they created a similar Chanel Paradoxal Dupe with it! Thanks Cel ~ It is a beauty for sure! Lacquer Ware ~ Haha you said it perfectly, too cute! Arie ~ Thank you, I bought it because it looks like snow, it looks pretty layered although I haven't done much experimenting with it.